Channel delays: 35mins delay 19h55 P&O Calais-Dover, departs 20:30. LD Lines Portsmouth-Le Havre arrives 06:30 tomorrow. Weather alerts: Red alert for high winds Serbia. Amber alerts for heavy rain/storms across south from north Spain, north and south Italy/Sardinia, Croatia and Montenegro. Weather: Rain in the south, unsettled through the Mediterranean. Alpine snow. Romania Roads Restart: Transfagarasan almost in reach. There’s an encouraging resurgence in Romania’s road building programme. Construction starts again this week on a bridge over the Dambovita River in east Bucharest. Meanwhile, the redeveloped Uranus Boulevard through the city centre is on course to open before Christmas. Both will help ease the capital’s chronic traffic problems but it’s out in the sticks where the really important work is being done. New contractors have finally been appointed to finish the A1 between the Hungarian border at Nadlac and Arad. The section Arad-Pecica is already 85% complete. Pecica-Nadlac is just 20% finished but the ground work is done and the terrain is easy. This section of the A1 is only 25 miles long but when it’s finished Romanian cities will be linked to the European motorway network for the first time (well, as soon as the Hungarians have filled in the last 16 mile gap in the M43 between Szeged and the Romanian border, currently under construction). There will still be some gaps to Transfagarasan. The black sections on the map above currently have no building. The blue section between Lugoj and Deva has sections opening seemingly at random. When we drove this road earlier this year there was a man at the side of the road directing traffic onto a stretch opened that day, seemingly to the surprise of everybody. What it does mean is that of the 1,300 miles between Calais and Jeremy Clarkson’s ‘World’s Best Road’, only 100 miles will not be on motorway. Believe us, that will make all the difference. Interbrand love-in: Mini congratulates 911 on its fiftieth anniversary, dug up from the BMW picture archive. Have never, ever heard of one brand sincerely congratulating another on its enduring success. 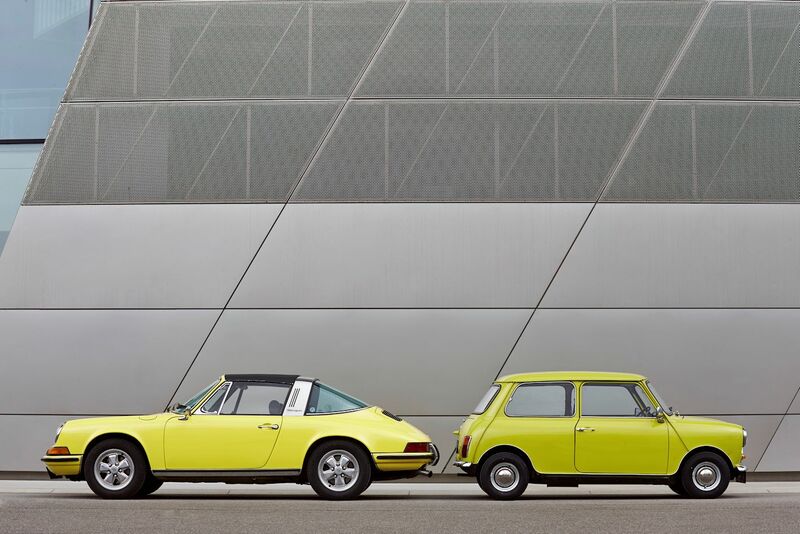 Note the original Mini was exactly the same height as the first 911. Amid controversy over the enlarged proportions of the third generation modern Mini launched yesterday – and similar growth in the 911 over the years – would be interesting to compare the two today.